1. A soldier fires 10 bullets per second from a machine gun. Each bullet has a mass of 50g and travels at 100ms-1. 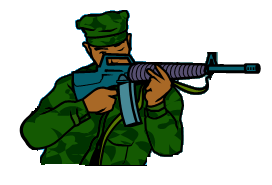 Calculate the force exerted by the soldier on the gun. Hint: Solution: 2. A 200g rubber ball hits the ground at a speed of 30ms-1. As it hits the ground it squashes and then bounces back up at 25ms-1. If the time in contact with the ground is 0.01s calculate the force exerted by the ball on the ground.